To offer quality performing arts events and help local residents develop performing arts skills focusing on Theatre and Music. Present Summer or Fall stage musical productions. 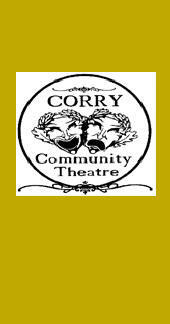 Seek out local performers, producers, technicians and new individuals to be part of the Corry Community Theatre. Perform Broadway review at Sunday in the Park. Provide Production previews for Corry Area Arts Council events. 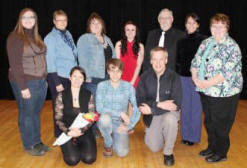 On Saturday April l3, 2013 the five finalists performed in the Corry’s Got Talent contest held at 7 pm in both the CAHS auditorium and the parking lot. Appearing were the Rev John Zimmerman, a magician, who is pastor of the First United Methodist Church here in Corry, the Keeper Singers, Barb Kimmy, her daughter Kim, and her sister Christine Matteson from Spring Creek, Dani Maloney, a dancer who is a student of CAHS, Phil Drake, singer-guitar player who is a recent graduate of CAHS and Lindsey Hinger, a Clymer resident and student at JCC who danced with hula hoops and fire. Appearing above are first row – Lindsey Hinger, lst Place $300.00, Phil Drake, 2nd Place $150.00, and Rev John Zimmerman, 3rd Place $75.00. Second row are Keeper Singers, Kim Kimmy, Barb Kimmy, and Christine Matteson, Dani Maloney, and judges Dan McEldowney, Christine Cruz, and Debbie Myers.